My son’s birthday is in the summer so he already had some ideas about what he wanted to do (water gun fight, pool and slip and slide). 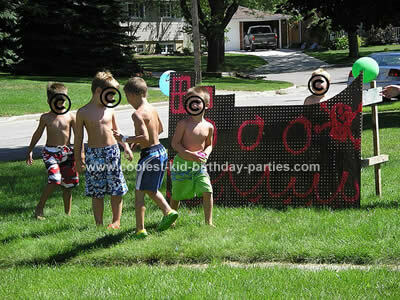 I wanted a theme that would tie in to all of that and give the kids something to do besides just swimming. 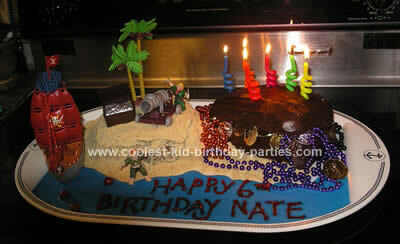 A pirates birthday seemed to be a perfect fit and there were lots of great ideas out there already for me to ‘borrow’ (this site was a GREAT help!). We made our own treasure map type invitations on aged looking paper and rolled them up and tied with ribbon to look like a map. We got lots of decorations from the dollar store and fortunately since the dollar store was already putting out some of their Halloween stuff it was even better we were able to get some skull things to add to the theme. Also, we got some pirates of the Caribbean stuff that was on clearance from Toys R Us so that was great! We put up a welcome sign on our front door directing the guests to come around back “if ye dare” so that we could be in the fenced backyard where all the games and stuff were. We had a banner from the dollar store that was really for Halloween. It had a big skull and welcome on it so we hung it on the gate. 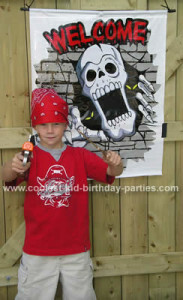 We had a LOT of activities planned for our pirates birthday party! I wanted to make sure the kids were kept busy since they were all 5 and 6 and there was quite a few of them there. When they first arrived I had pirate coloring sheets and mazes out for them to do and my older kids had two stations set up one with temporary (pirate) tattoos and one with face painting of scars and whatnot. We also had some fishy crackers out for snacks but we didn’t serve food since the party was from 1-4. When all the kids were there we started in on the games. My kids had a blast making the games earlier in the week. My older daughter helped blow up and stuff the balloons for the POP THE CANNONBALL game which was black balloons filled with gumballs and small candies (2-3 in each). The kids had to try to pop the cannonballs (balloons) with foam swords from the dollar store. This was a great game! My youngest, the birthday boy was very busy making a pirate ship out of Bristol board complete with sails (see pics). We glued this to the front of a large cardboard box and cut three holes in it. The object of this Pirates birthday game was to BOMB THE PIRATE SHIP with blue (couldn’t find black) tennis balls from the dollar store. 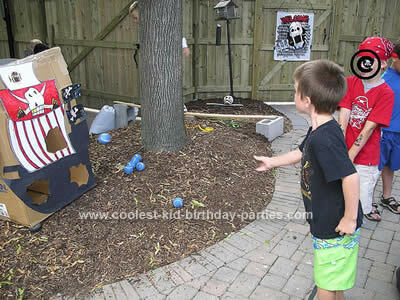 Another Pirates birthday game we played was WALK THE PLANK on a plank set up over our garden with some snakes and a skull underneath. 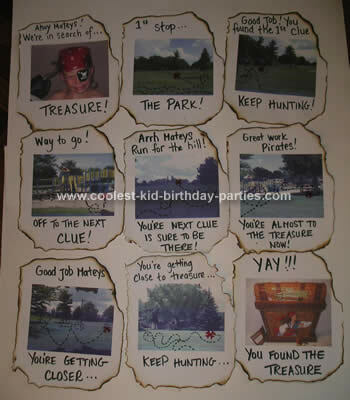 We also played PIN THE TREASURE ON THE MAP with a treasure map I got in a playset and some plastic coins with tape on the back. 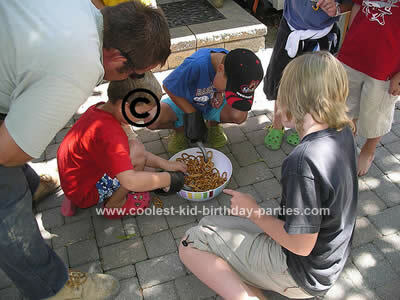 We had another Pirates birthday game called PIRATE PRETZELS where the kids put on pirate hook on their hand and tried to see how many pretzels they could hook in 10 seconds. Lastly we played TOSS THE TREASURE where the kids tried to drop a coin into a small glass which was set into a bigger bucket with sand around it and small crocodiles in the sand. 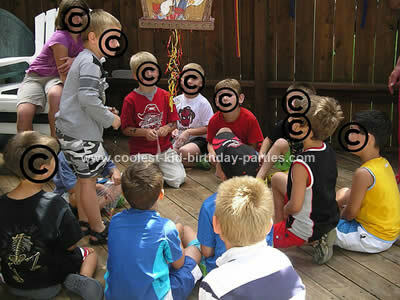 For the Pirates birthday games I split the group into two and half the kids played one game while half played another. It made it easier to manage them all and less of a wait for a turn. If they won one of the games (and there were lots of winners) they got a gold coin which they later got to trade in for real ‘treasure’ (little toys and candy). At the end of the games they came up to the treasure chest and traded in their coins – there was one big treasure for each child (pirate themed toy) and then they used the rest of their coins for the smaller treasure (little trinkets and candy). Then we took a break to open some presents while my older son and daughter ran over to the park (just across the street) to hide the treasure maps and the treasure. We had gone over earlier in the week and taken some photos around the park and made each of the photos into a mini treasure map (since the kids can’t read well). We put an X where the next clue was hidden and then burned around the edges to make it look cool (see pics). They had to follow the clues to find the treasure. The treasure they were looking for was a pirate of the Caribbean piniata. They had a BLAST on the treasure hunt running all over the park following the clues. It worked perfectly! When they had found the piniata they brought it back to our house and we did that. After that it was time for our Pirates birthday cake. I LOVE to make themed cakes and was really looking forward to this one. We had found a little pirate set at the dollar store and my son wanted to use it on the cake so I baked half of the mix in a mixing bowl to make a small ‘island’ which I covered in icing and graham crackers to look like sand and set some of the pirate set up on. Then the other half I baked in a loaf pan which I cut in half to make it look as though it was a treasure chest partially buried in the sand. I iced and put some treasure on then iced the lid and put it on. I sprinkled some more sand and treasure around. For the water I used icing sugar mixed with a little water and a lot of blue icing tint. It was a very thick runny consistency and make perfect water. I placed the pirate ship and some cannonballs in the water. The cake turned out GREAT (see pics). 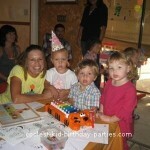 The kids loved it and all sang happy birthday to my son. We had ice cream and juice boxes with the cake and served it on pirate themed party wear. After the cake and ice-cream the kids got into their bathing suits for the water activities. The first activity was the water fight that my son had wanted since the beginning. We didn’t have enough water guns for all the guests and they are too $$ to buy so I talked him into water balloons instead. My older son and husband cut two wooden pirate ship shapes out of pegboard and stood them up in the front yard. We painted portholes windows and a skull and crossbones on each of them (see pics). These were used in the water fight one for each team to stand behind. They didn’t take long to make at all maybe 10 – 15 minutes but the kids LOVED them! We gave each team a big bucket of water balloons and let them battle it out. They had a ball! After that we split the guests into two teams and half went in the pool. (I am a nervous wreck and didn’t want them all in there at once!) While half went on the slip and slide which is one of those double ones. They had fun with this part as well and despite me being nervous it was great. I had asked parents ahead of time if their child needed a life jacket. And I had enough for everyone on hand. Plus I had told parents that we would be swimming for the last half hour only. So if they wanted to come back and watch their child or swim with them they were welcome. I did have lot of extra hands to help out. My mom and my mother in law as well as my older kids was there to lend a hand. Which is what made it most successful. I never could have done this pirates birthday party all alone. 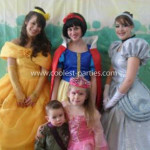 I was really pleased with how it all turned out and I think the kids had a lot of fun. My son thought it was great and he and his friends in the neighborhood are still playing with the games. Thanks for all the great ideas on this site and hope my ideas can help others too!